Hyperbaric medicine can be defined as a medical treatment in which an ambient pressure greater than the sea level atmospheric pressure is a necessary component. Hyperbaric oxygen therapy (HBOT) devices are used for delivering pure oxygen (100%) to the tissues under higher atmospheric pressures. In hyperbaric oxygen chambers or devices, the atmospheric pressure is increased from one to three times higher than normal atmospheric pressure. Globally, increasing instances of acute and chronic wounds and increasing infections are expected to drive the demand during the period of study. Geographically, North America dominated the hyperbaric oxygen (HBO) therapy devices market driven by world class healthcare infrastructure with a technologically advanced practice, higher spending and presence of key industry players in the region. North America was followed by Europe and Asia-Pacific as second and third largest market for hyperbaric oxygen (HBO) therapy devices market. Asia Pacific is projected to have the fastest growth, owing to a rapidly developing medical infrastructure, increasing spending on healthcare and growing medical tourism in developing nations such as China and India in this region. This report identifies the hyperbaric oxygen (HBO) therapy devices market size for the years 2014-2016, and forecast of the same till the year 2022. 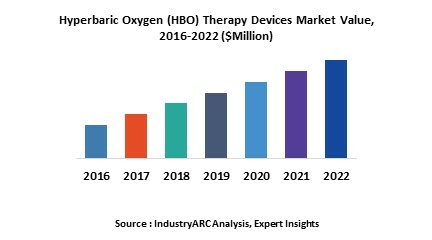 It also highlights the market drivers, restraints, growth indicators, challenges, and other key aspects with respect to the hyperbaric oxygen (HBO) therapy devices market. 14.3. Fink Engineering Pty Ltd.
14.4. Gulf Coast Hyperbarics, Inc.
14.11. SOS Medical Group, Ltd.